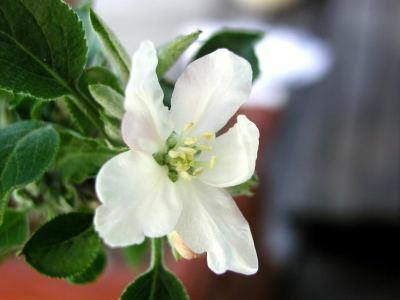 Most apple varieties are self-sterile and require a pollinizer. 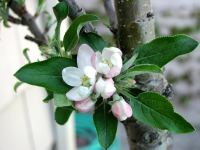 All apple varieties listed except Red Gravenstein, Jonagold, Red Rome, Red Winesap, Northern Spy, and Granny Smith can be utilized as pollinizers. Akane - A cross Of Jonathan and Worchester Pearmain with fruit that is medium, round oblate. Skin is bright solid red, similar to Jonathan, thick and smooth. Flesh is white, firm, crisp and juicy, slightly coarse. Flavor is sub-acid, resembles Jonathan, quality excellent. Recommended as a dessert apple and for processing. Fruit holds well on tree. Well suited for warmer climates. It is a good pollinizer for Delicious and has good commercial possibilities. Excellent variety for Northern California. Beverly Hills - Yields heavy crops of attractive, medium-sized fruit, striped red and yellow. Fruit is juicy and somewhat tart. Low-chilling variety (250 hours) that bears especially well in Southern California coastal areas. Ripens mid-August. (Early/self fertile). Braeburn - Excellent flavor, mildly sweet and aromatic with firm, crisp and juicy texture. Very late maturing with excellent storage life. 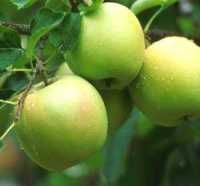 ​​ Dorsett Golden - Resembles Golden Delicious with yellow skin and red cheek. Flesh is firm, smooth and crisp with a sweet-tart flavor. Large, vigorous tree. A low-chilling (100 hours) apple that does very well in warm winter climates. Pollinates well with Anna. Ripens June-early July. (Early/self fertile). Ultra Dwarf Patio Tree (image). Fuji - Truely the home gardeners' favorite and deservedly so! This outstanding Delicious cross originated in Japan. Resembles Delicious in color. Flesh is very firm, crunchy, juicy and slightly acidic. Excellent flavor and outstanding shelf life. Trees are vigorous, hardy and productive. Bears heavy crops. Keeps very well. Ripens September to October. (Late/self fertile).Ultra Dwarf Patio Tree ​(image). Golden Delicious (also called Yellow Delicious) - An excellent multi-purpose apple that is unsurpassed by any other golden apple. One of the leading commercial varieties that does an outstanding job for the home gardeners too. Large golden fruit that is juicy and of exceptionally fine flavor, aromatic and crisp. Golden Delicious is a heavy, early producer and an excellent pollinizer for most other apples. Requires thinning for size and annual production. Good for most Southern California climates. Gravenstein - Large, round fruit, striped with red. Flesh is crisp, juicy and delicious. Tree is very vigorous with an upright spreading habit. Medium, low chilling requirement. Good fresh and the most popular cooking apple. Ripens early to mid-August. (Early/needs pollinizer/pollen sterile) (image). Red Gravenstein - Improvement of an old favorite cooking apple. Fruit is large, skin solid dark red. Especially good for pie and applesauce, it is also very tasty eaten fresh. Another fine apple that does well west of the Cascades. Ripens somewhat irregularly and should be picked several times. Ripens early to mid-August. (Early/needs pollinizer/pollen sterile). 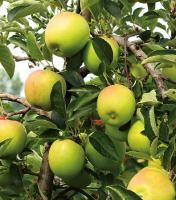 Jonagold - A Golden Delicious cross Jonathan that is considered by many as the best dual-purpose apple on the market today. A large apple that ripens just after Golden Delicious. Skin is 80 percent red striping over yellow ground color. Flesh is firm, sub-acid and juicy, similar to Jonathan in flavor. Excellent dessert and processing quality. Keeps well in storage up to 6 months. Productivity comparable to McIntosh. In colder areas, can be subject to winter injury. Good "west of the Cascades" apple. Ripens mid-September. (Late/needspollinizer) ​(image). Jonathan - A small, very red,juicy and crisp slightly tart apple. Resistant to scab. A good all purpose apple. (early to mid/needs pollinizer apple). King - A good-sized apple with greenish-yellow skin that is red striped. Standard fall, dual-purpose fruit with good quality for cooking and eating. Excellent for growing west of the Cascades. Stores well. Ripens September. (Late/self fertile). McIntosh - The fruit is uniform, medium to large with an attractive bright red color on this extremely hardy and vigorous tree. Flesh is white, sometimes veined with red; firm, fine, crisp, tender, aromatic and very juicy and sprightly sub-acid. 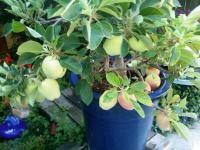 The fruit ripens in September, good for both eating and cooking, and stores well for Christmas use. Does best in areas that have cooler fall nights. Well suited for medium to high desert areas. Melrose - This Jonathan-Delicious cross is medium to large. Skin is attractive, resembles Jonathan in color and shape. Flesh is white and mildly sub-acid, not as tart as Jonathan. Stores well, maintaining excellent flavor into May. Tree is very productive and bears at an early age. This tree does well west of the Cascades. Ripens September. (Late/needs pollinizer). Mutsu (also called Crispin) - Originated in Japan. 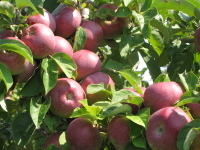 An Indo variety and Golden Delicious cross which matures later than Golden Delicious. Fruit is very large; skin is smooth, golden yellow, blushed with orange on exposed cheek. The flesh is yellowish-white, crisp and rather coarse compared with Golden Delicious. Mildly sub-acid. Very good quality for dessert and cooking. 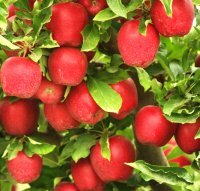 Considered as replacement to Golden Delicious because of strong resistance of leaves and fruit to spray injury, vigorous growth of tree, late storing quality and larger fruit. Ripens mid to late September. (Late/needs pollinizer) ​(image)​. Newtown Pippin - The classic American apple. Fruit is green and yellow skinned with reddish-blush. The flesh is firm, juicy and of good quality. Low chilling requirements. Excellent dessert and processing apple. Very good for cider. Pettingill - Large, red-blushed green to red. Firm, white, tasty, moderately acid flesh. Large, upright productive tree with very low chilling requirement. Bears early. Ripens late August, early September. (Midseason/needs pollinizer). Rome Beauty, Law Strain - An old favorite that holds its shape well in baking and is good eaten fresh. Large size and very good red color. This is one of the very best strains available today. Does well in frost areas. Ripens mid to late September. (Late/needs pollinizer). Spartan - A McIntosh-Newtown cross. Fruit is medium; skin is highly colored solid dark red. Flesh is firm, crisp, white juicy with very good quality and texture. Strong, heavy producer. Keeps well until February. More resistant to pre-harvest drop than McIntosh. Ripens about 2 to 3 weeks later than McIntosh. Winesap - Fruit is medium in size; skin color is yellow with red stripes. Apple is crisp and juicy with a coarse texture. Good for canning . Keeps well. (Late season/needs pollinizer) (image). Winesap, Red - Same as above but more red in appearance. Winter Banana - Large, attractive, pale yellow blushed pink with waxy finish. Flesh is tender and tangy with distinctive aroma. Excellent mild-winter variety. Good pollinizer for other varieties. Ripens October. (Late/needs pollinizer). Yellow Transparent - Medium to large, greenish-yellow apple lightly blushed on one side. Tart flavor, good for cooking. Widely planted early commercial variety. Ripens mid-June to mid-July. Baldwin Woodpecker - Yellow skin, striped red. Yellow flesh, juicy, hard and crisp. Cox’s Orange Pippin - Outstanding flavor, juicy and firm. Aromatic. Good for dessert or processing. Golden Russet - Round, golden russet with a bronze cheek; flesh crisp and tender. Sugary, juicy. Good eaten fresh or for desserts. Excellent keeper. (Mid to late/needs pollinizer) ​(image). Grimes Golden - Rich golden-yellow. Flesh tender, crisp, juicy and aromatic. Good for eating and freezing. Pink Pearl - Small apple with a pink blush over yellow skin. Flesh is a light pink color. Tender, smooth, juicy tart flavor. Very attractive applesauce. Pound Sweet - Fruit is large in size. Skin is light to dark green with whitish cast. Peculiar, sweet flavor. Good for baking and canning. Late harvest season. Red Spy - Tree is upright and hardy. Skin color has bright red stripes. Apple is tender and juicy. Good in cooking. Old apple variety. (Late/partially self fertile). Roxbury Russet - Fruit is mid size with roundish shape. Skin is very russeted. Good cooking apple. Snow Fameuse - Bright red skin, pure white flesh, sometimes streaked red. Crisp, aromatic, juicy. One of the oldest varieties. Excellent for fresh eating or desserts, not for cooking. Grows best at high elevations. (Mid to late season/self fertile). Spitzenburg - A large apple, bright red skin, dotted yellow. Firm, crisp, tender. Very good, slightly acid flavor. (Late/self fertile) (image). Summer Rambo - Summer apple. Skin is greenish with a red blush. Good cooking apple. (Early/self fertile). Wold River - Tree is a strong, hardy and spreading grower. Skin color is red. Apple is very large.